Challenge: design glyphs to represent the numbers one through twelve. The glyphs for two numbers that are opposite on the clock face (like 12 and 6) should have some visual qualities that bind them together as a pair. If you look at the glyphs for any two numbers that are adjacent on the clock face (like 1 and 2), it should be easy to see which glyph represents the “lower” number in clockwise order, and which glyph represents the “higher” number. The glyphs for any three numbers that form an even division of the clock face into three parts (like 12, 4, and 8) should have some common visual feature that makes them recognizable as a group. The glyphs for any four numbers that form an even division of the clock face into four parts (like 12, 3, 6, and 9) should have some common visual feature that makes them recognizable as a group. The parity of a number (whether the number is odd or even) should be somehow discernible from its glyph. 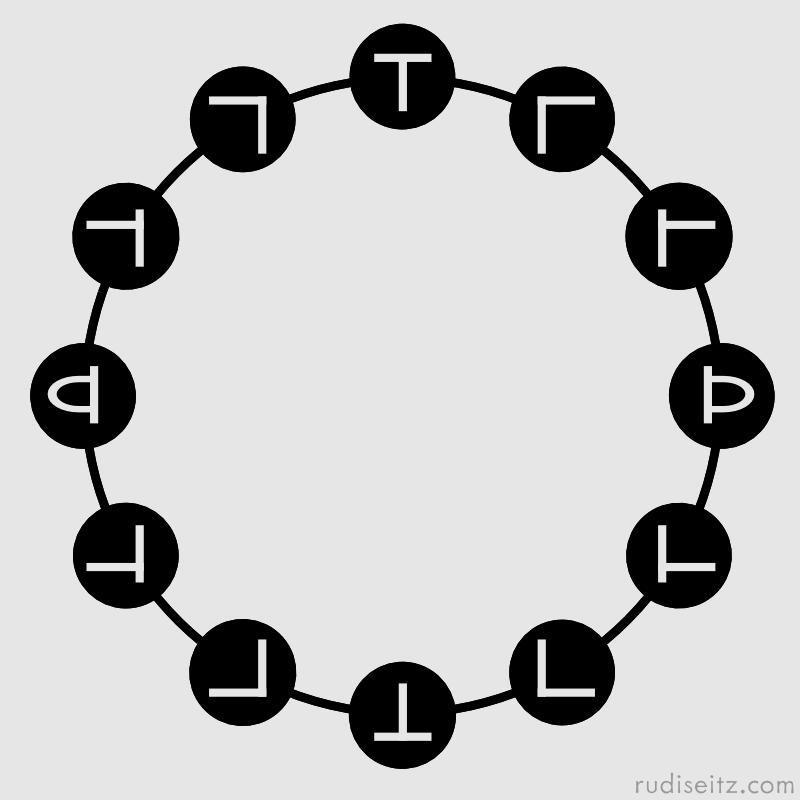 Thinking of this problem in musical terms, the glyphs could represent the 12 notes of the octave (assuming 12TET). Looking at any glyph, you should be able to quickly discern the following things about the note it represents: which of the four augmented triads does the note belongs to? Which of three fully-diminished seventh chords does it belong to? What is its tritone, and what is that tritone’s glyph? What are its upper and lower chromatic neighbors, and what are their glyphs? I haven’t solved this. But, to jog your imagination, here’s one of many glyph systems I’ve come up with while considering the problem. Do you think it has any nice properties? Can you do better?